The process of bringing the public fresh-from-the-ocean wild salmon begins with the trollers. The men and women who work the 14 hour days, rain or shine, to take advantage of the narrow window of opportunity provided by the wild coho and chinook salmon runs. 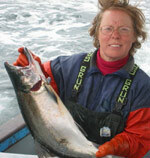 Although they are not the only ones involved in the often complicated logistics of getting troll-caught wild salmon to the fresh fish marketplace, from the boat deck to the barbeque deck, we would like to begin introducing you to the CSMA community by sharing a few troller biographies. 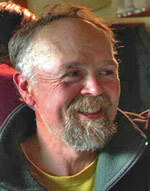 Greg Howe started hand trolling in 1967 at the age of 15 when he fished in Lynn Canal and Glacier Bay. At that time his craft was his family's 21-foot Glaspar cabin cruiser, the Tyee. He was fishing with rod and reel and only sold fish a couple times that summer. He says he didn't start seriously commercial fishing until 1975 when he hand trolled from the Windrush, a 26-foot sailboat. Nowdays he fishes aboard his power troller the Keta. Greg lives on the Inian Islands year round and also has a hand troll permit. In the winter he really enjoys fishing from his 18-foot skiff Hobbit Hole for the elusive and much-prized winter king salmon. 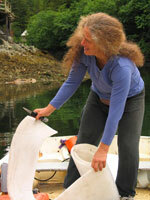 In 1977 Debra Page bought an outboard engine, borrowed an 18-foot skiff and became an Alaskan fishing captain. Her boats grew larger as her two sons Taiga and Ryland grew strong catching and eating their wild king, silver and red salmon. On board the Madam Ching, she has shared her love of the Southeast Alaskan wilderness under the Fairweather Mountains with her sons, and her pride in providing the best eating fish in the world. "I'll fish forever," Debra says, "Or until I stop feeling awe when I see a humpback whale or feeling a volt of joy when I pull in a big king salmon." Debra's children's book, Orcas Around Me (Albert Whitman 1997), tells the adventures of family fishing in Alaska. (Her husband Bobo-o captains his own troller). Orcas won the Alaska Literacy Council's best alaskan kid's book award in 2000. Bob Bell's sense of humor is obvious in his boat name, The Village Idiot, but Bob-o is serious about bringing excellent Alaskan wild king salmon, silver salmon, and red salmon to the market. 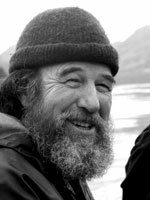 Since 1978 he has fished northern Southeast Alaska under the Fairweather Range of mountains, and raised his sons Taiga and Ryland to appreciate this special wilderness and the Alaskan wild salmon that thrive there. The one thing Bob-o likes more than catching salmon is eating salmon. 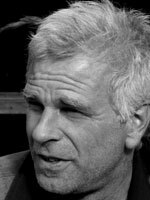 His favorite recipe is a fresh grated ginger and tamari marinate on a grilled fillet cooked only long enough to make the wild salmon flake onto his fork. Coming to Alaska in 1977 as a fish biologist, Hap soon realized that he could learn more about fish by being out on the water with them than he could by reading about them. One thing led to another, and by 1983 he had â€œcaught the bugâ€� and was fishing his own boat. Three years later he relocated to Cross Sound, and not much longer after that he realized that he could make a living catching fish. 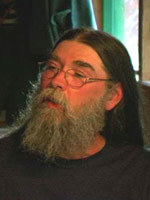 When he is not fishing, Hap might be crunching numbers to estimate fish populations, smoking fish, or playing the drums. He has set a goal of becoming the hermit-at-the-head-of-the-bay in Elfin Cove, but is failing miserably at achieving it. Hap is pleased to participate in a fishery managed on a sustainable basis, in which the Alaska Department of Fish and Game takes care to ensure adequate spawning escapement, while allowing careful harvest of the surplus. 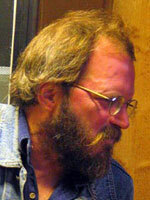 Phil Emerson started hand trolling in 1974 in a plywood dory he built himself. He has fished every year since, though has owned a 32' fiberglass powertroller since 1979. He lives in a remote southeast bay, population 4, where he and his wife raised and home-schooled their 2 children. Phil is capable of doing most anything that comes up, both on the boat and living a subsistence lifestyle. He harvests seafood year-round to feed his family the best diet on earth. 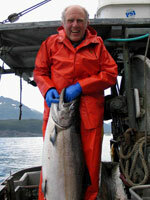 His commitment to delivering the best possible quality salmon to the public is deep. He refuses to sacrifice quality for quantity, even when it affects his income. He hopes to continue fishing far into the future, so has a solid stake in maintaining the abundance of salmon through sound management of their runs. Ericâ€™s father, Wilhelm â€œSkipâ€� Jordan started fishing Cross Sound with Ericâ€™s mother, Marilyn, in 1946 on the 32 foot â€œSaltyâ€�. Ericâ€™s grandfather â€œChristianâ€� hand trolled out of an open skiff in Southern Chatham in the early 60â€™s. Eric has been hand and power trolling his own boats in Cross Sound nearly every season since 1978. Eric and his wife, Sarah, show up nearly every year for the fall coho run on their present boat the â€œI Gottaâ€�. 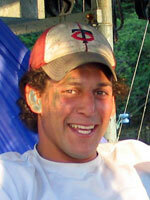 They were joined in 2005 by son, Karl Jordan, on the â€œLoryâ€�. Eric has been active in troll fishery politics since the mid 70â€™s and is considered a pioneer in the round chum and pink fisheries. The Jordan family life trolling is chronicled in Marilyn Jordan Georgeâ€™s award winning book, â€œFollowing the Alaskan Dreamâ€�. 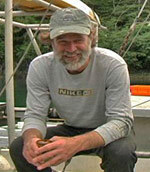 The only certifiable Norwegian in our fleet, Steve has been fishing commercially for over 25 years from Oregon to Alaska. Every morning at the crack of dawn, the Stromme-dog ventures out on the briny deep with his trusty cat, Puss (who eats fish only if it comes from a cat-food can). Sometimes he is also joined by his daughter Katie, or his son, Erik (who got straight-Aâ€™s in school last year). Now and then Steve will take a break from his fishing day to enjoy his favorite fishing recipe: open a bag of Doritos, and eat them till theyâ€™re gone. 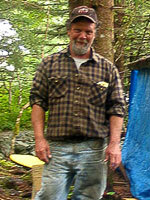 D ennis arrived in Ketchikan, just after finishing High School, to become a logger. A fellow on the street suggested he walk the docks and look for a crew position on a purse seiner instead. He was hired on the "Claudia", made $600 cash the first "opener”, and has been fishing ever since. It has been said that many old growth trees breathed a sigh of relief the day Dennis was diverted to fishing. He started hand trolling with his own boat several years later. e tradition that bigger is better, he fished larger and larger boats until he had a 50 foot troller and was freezing his fish at sea. It was rewarding but kept him from being with his family. Dennis now fishes a 23 foot boat, the "Eye Catcher", when he is not busy running his small fishing resort, "South Passage Outfitters". He knows that quality Salmon depends on the fishers handling of it from the moment the fish is caught to the time it heads to market. Dennis is happy to be part of this community of professional fishers. "Many of my fondest memories are of fishing. Catfish and crawfish in the Blue Ridge Mountains. Trout in Yellowstone country. 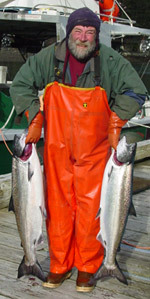 Salmon purse seining and shrimp fishing in Alaska. In the summer of 1974 I stumbled into salmon trolling. One of my favorite pastimes and they even pay me for the fish. I'm still at it!"